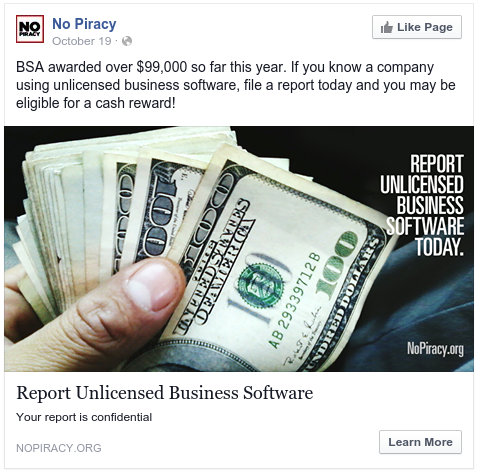 The BSA has no interest whatsoever in stopping piracy. What they do want to do is collect money for unlicensed software. That's not a subtle difference. It hurts YOU to destroy your employer. The awards from a court settlement can bankrupt a small business. You'd be awarded a cash amount that can equal one or two regular paychecks, and you're pounding pavement, competing in interviews with your former co-workers. Here's a better idea... Show them the BSA's ad and suggest a move to Open Source software to remove the liability of unlicensed software. LibreOffice can fully replace Microsoft Office. Lose Outlook and replace it with Thunderbird. Ubuntu Server can eliminate Exchange. Alfresco replaces Sharepoint. GnuCash does accounting. Gimp is free... Photoshop isn't. You don't even need to license Windows when Linux is in the house. And libre software plays well with licensed software. By switching to Open Source where you can, you free up funds to license software you NEED to license, and that gives you a leaner, better, more profitable business. That's a lot better than wasting money on commodity software like word processors.